A crowd-pleasing dish that is easy to make and easy on the wallet. Serve it morning, noon or night as a side dish or an entrée. Preheat oven to 350°F. Cook grits according to package directions. Remove grits from heat, stir in cream cheese and half of cheddar cheese until melted. Stir in greens, eggs, salt and pepper. 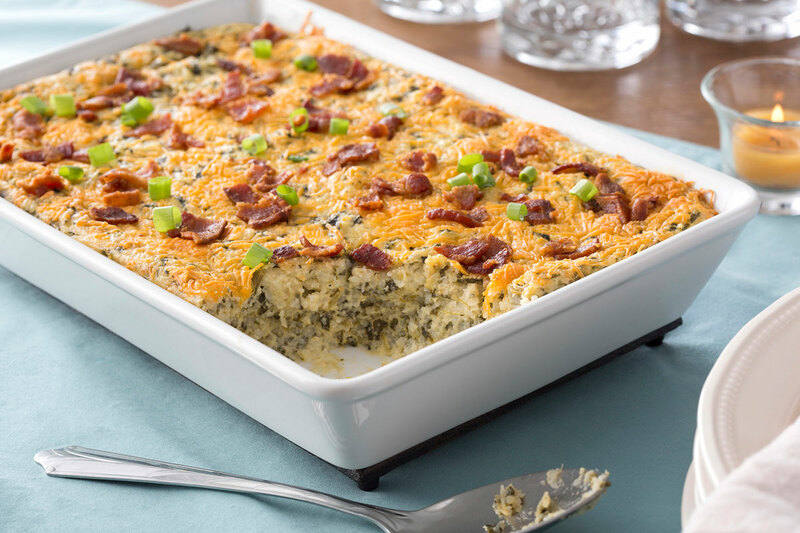 Pour into a lightly greased 13 x 9-inch baking dish, sprinkle with remaining cheese and bacon. Bake, uncovered, 55 to 60 minutes or until set and golden brown. Sprinkle with green onions before serving. Spicy Grits & Greens – Stir in 1/8 to 1/4 tsp. cayenne pepper with salt and pepper in Step 2.